We then took to the streets heading west on King and looping around J Square, putting up tons of stickers and yelling our faces off: “Every gender, every race! Punch a nazi in the face!” Back at King and James, we paused to heckle some anti-choice losers who had set up signs, then continued south to Charleton to end in Durand Park. 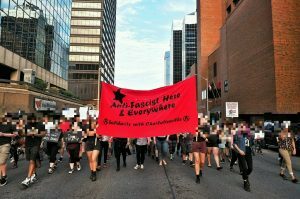 While the battle raged in Charlottesville on Saturday, lots of comrades in Hamilton were participating in a large tenants conference in this park, planning for direct action against landlords. Confronting the far-right physically is vitally important, but it’s also necessary to undercut their rhetoric and point towards our real enemies: we’re not struggling to find housing and living in poverty because of migrants – it’s because of bosses and landlord! Lots of people in Hamilton are thinking about the brave folks who mobilized in Charlottesville to push back against the far-right and though we’re up in Canada, many of us still feel deeply implicated in and affected by what happened. Gathering together on Monday to show our collective rage also gave us a chance to find each other, share ideas, take up space, and imagine what comes next. In solidarity with Heather, those injured, and everyone who has been mobilizing to confront the far-right these past months. This was written by THI. Posted on Wednesday, August 16, 2017, at 17:59. Filed under In the Area. Bookmark the permalink. Follow comments here with the RSS feed. Trackbacks are closed, but you can post a comment.